Jimmy Jangles presents: The Optimus Prime Experiment: Thrawn. He's all that and a bag of chips. I just finished the Star Wars book 'Heir to the Empire' and immediately (and finally) understood what all the fuss was in terms of Grand Admiral Thrawn. He's the chief antagonist of the book and it's quite clear from the first few paragraphs he feature in that he's the real deal. Inspired by this belated introduction to the Big Blue Chiss, I thought I'd present some facts about him. Timothy Zahn, the author who created this beloved character described Thrawn as thus: "He’s a clever villain. People like reading about clever, interesting opponents to our heroes. People who are able to out think, outmaneuver as well as outfight. Ultimately the heroism of the hero is measured by the villainy or power of the villain and with Thrawn I wanted something different than Force using Vader or Palpatine. Somebody who doesn’t have Luke’s Force Powers, but can run him around in a maze whenever he really wants to." While he make's his debut in Timothy Zahn's 'Heir to the Empire' novel, Thrawn has actually appeared in 8 novels, several graphic novels and turned up in a few video games. 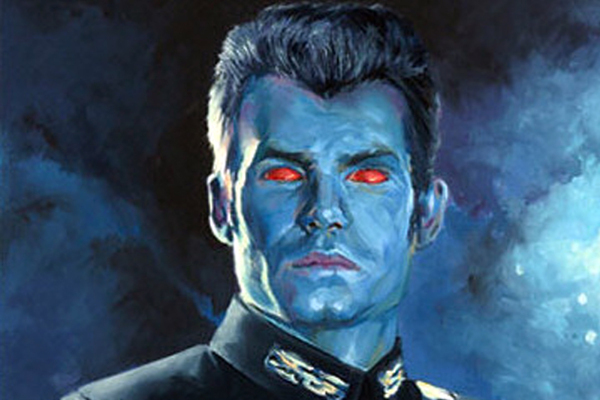 Thrawn's species is 'Chiss'. All Chiss are human like in their physical appearance, save the blue skin and red eyes. The name "Coruscant" was originally used by Timothy Zahn. George Lucas was going to include the capital world of Had Abbadon in Return of the Jedi, but adopted Zahn's name for Imperial Center when presenting the planet in the Special Edition and prequel movies. Zahn has said thatThrawn's character is a composite of various historical and fictional personalities, including Erwin Rommel, Robert E. Lee, Hannibal Barca, Alexander the Great, and Sherlock Holmes. Some of those names are the greatest military leaders of history. The Secret History of Star Wars by Michael Kaminski credits the Thrawn trilogy with reigniting the general public's interest with the Star Wars franchise.